The Bahamas government signed an agreement with Cuba to establish mutual cultural relations including the establishment of student exchange programs that will benefit both countries. The agreement comes while the Fiesta del Fuego takes place in Santiago, culminating on Thursday and which has among its guests of honor 300 Bahamians participating in the celebration. The Bahamian delegation is composed of artisans, musicians and chefs and representatives of "Junkanoo", an indigenous popular expression of these islands which involves tribal dances to the beat of drums and bells and dances with masks and colorful costumes. 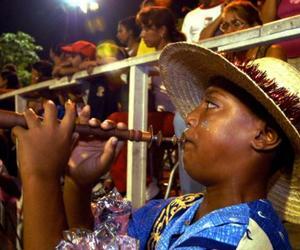 Johnson stressed that the cultural agreement with Cuba is part of the Bahamas plans to continue to show the culture of their country to the world and involves the universities of Santiago, Havana and Bahamas, which will seek ways to "promote, protect and document all our great cultural history."